The Rocky Mountain elk (Cervus canadensis nelsoni) is a subspecies of elk found in the Rocky Mountains and adjacent ranges of Western North America. The winter ranges are most common in open forests and floodplain marshes in the lower elevations. In the summer it migrates to the subalpine forests and alpine basins. Elk have a diverse habitat range that they can reside in but are most often found in forest and forest edge habitat and in mountain regions they often stay in higher elevations during warmer months and migrate down lower in the winter. They may even come down the mountain and leave the forest into some grassland for part of the day but head back into the timber in the evening. The total wild population is about one million individuals. The Rocky Mountain elk was reintroduced in 1913 to Colorado from Wyoming after the near-extinction of the regional herds. While overhunting is a significant contributing factor, the elk’s near-extinction is mainly attributed to human encroachment and destruction of their natural habitats and migratory corridors. A year later, twenty-one elk from Jackson Hole, Wyoming were reintroduced to South Dakota's Wind Cave National Park for population increase. Conservation efforts also brought the elk populations in New Mexico from near zero numbers in the late 1800s and early 1900s, to healthy populations in the 1930s in Northern New Mexico. Population numbers of elk in Nebraska continued to increase through the 1970s and 1980s, to a level in which complaints from landowners in the Pine Ridge region led to the implementation of relatively liberal hunting seasons in the late 1980s. Elk numbers continued to increase through the 1990s to the present. In 1990, feasibility studies were conducted to determine if wild, free-ranging elk still had a place in some of their former eastern haunts. Once this was complete, healthy source herds of Rocky Mountain elk from Arizona, Kansas, New Mexico, North Dakota, Oregon, and Utah were used to introduce this elk subspecies to the former eastern elk range. As of 2010, the Rocky Mountain elk herd has been diagnosed with a serious disorder called Chronic Wasting Disease (CWD). CWD affects the brain tissue of infected elk and is similar in symptoms to bovine spongiform encephalopathy (BSE), commonly known as mad-cow disease. There is no evidence to conclude that elk CWD is transmittable to humans, and research concerning CWD and its effect on the eco-system continues. Environmental and CWD problems in Estes Park, Colorado and, on a greater scale, throughout the Western U.S. and North America have local, state, and federal policy makers searching for solutions. 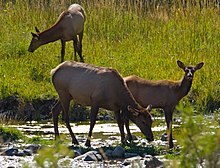 The Rocky Mountain National Park and the Estes Park environments are physically disrupted by the migration of the elk, ranging in size from calves to full-grown 700-pound adults. Several indigenous butterfly and plant species are harmed, especially the aspen groves that the elk herd of perhaps 3,000 animals decimates in its search for food. The elk population, while taxing the common food resources, also adversely affects native species that share the same food supply, such as the indigenous beavers. ^ Erxleben, J.C.P. (1777) Anfangsgründe der Naturlehre and Systema regni animalis. ^ "Elk - Living with Wildlife | Washington Department of Fish & Wildlife". wdfw.wa.gov. Retrieved 2016-01-27. ^ "Kentucky Fish and Wildlife Commissioner's Newsletter" (PDF). September 2014. ^ * Guiroy, D. C.; Williams, E. S.; Song, K. J.; Yanagihara, R.; Gajdusek, D. C. (1993). "Fibrils in brain of Rocky Mountain elk with chronic wasting disease contain scrapie amyloid". Acta Neuropathol. 86: 77–80. doi: 10.1007/bf00454902. PMID 8372644. Fish and Wildlife Habitat Management Leaflet. 1999. American Elk: Cervus elaphus. United States Department of Agriculture. Habitat Management Institute.